The Global Volcanism Program has no activity reports for Naruko. The Global Volcanism Program has no Weekly Reports available for Naruko. The Global Volcanism Program has no Bulletin Reports available for Naruko. Naruko is a poorly defined, 5.5 x 7 km caldera NW of the city of Sendai. The caldera, formed during eruptions about 73,000 and 45,000 years ago, contains a cluster of four dacitic lava domes of Holocene age surrounding the 400-m-wide lake-filled Katanuma crater. The highest of the low, but steep-sided lava domes, Ogadake, lies SE of the lake and reaches only 470 m above sea level. Ogadake and Kurumigadake domes are capped by conglomerates and mudstones uplifted during dome growth. The only known eruption in historical time occurred in 837 CE. Water vapor and sulfur-dioxide gas emission occurs from Shurado crater on Toyagamori lava dome west of the lake and from the bottom of the crater lake, which is one of the most acidic in Japan, with a pH of 1.6. Solfataras are found on the western shore of Katanuma, and sulfur is mined from sediments on the lake floor. Ban M, Takahashi K, Horie T, Toya N, 2005. Petrogenesis of mafic inclusions in rhyolitic lavas from Narugo volcano, northeastern Japan. J Petr, 46: 1543-1563. There is no Deformation History data available for Naruko. There is no Emissions History data available for Naruko. 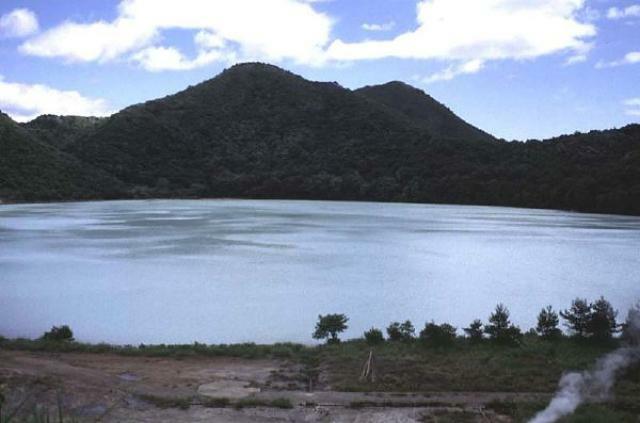 Katanuma lake in Narugo caldera is seen from its NW shore with Oga-dake lava dome forming the peak in the distance on the right-center horizon. Oga-dake, the highest of a cluster of lava domes surrounding the lake, is only 470 m above sea level. Katanuma is one of the most acidic crater lakes in Japan, with a pH of 1.6, and sulfur is mined from sediments on the lake floor. Narugo (also known as Naruko) is a poorly defined, 5.5 x 7 km caldera NW of the city of Sendai; its only known historical eruption took place in 837 CE. Copyrighted photo by Jun'ichi Itoh (Japanese Quaternary Volcanoes database, RIODB, http://riodb02.ibase.aist.go.jp/strata/VOL_JP/EN/index.htm and Geol Surv Japan, AIST, http://www.gsj.jp/). Large Eruptions of Naruko Information about large Quaternary eruptions (VEI >= 4) is cataloged in the Large Magnitude Explosive Volcanic Eruptions (LaMEVE) database of the Volcano Global Risk Identification and Analysis Project (VOGRIPA).